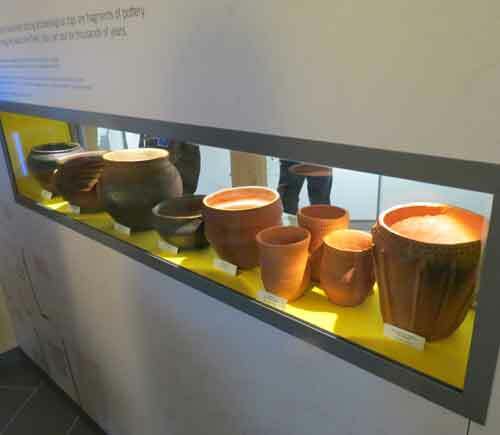 These webpages are devoted to the pottery of Bill Crumbleholme, which is largely inspired by the Bronze Age Beaker Folk and other prehistoric pottery styles. Visit the pottery section to see what Bill is currently producing. Bill runs pottery classes (which have a massive waiting list!) and occassional workshops. Follow this link to see this events page, where details of some of the forthcoming events can be seen, including workshops. 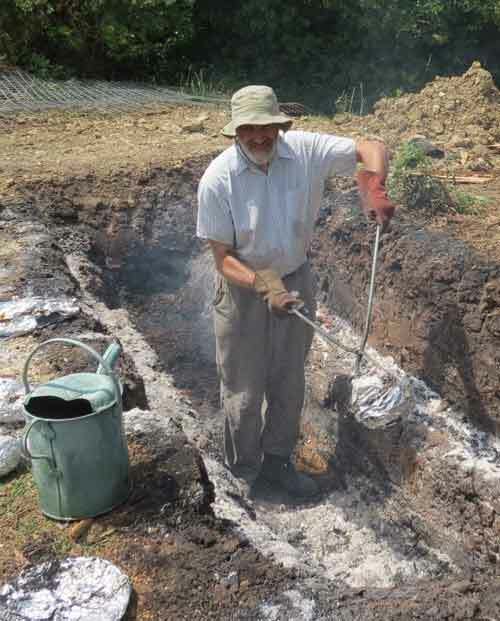 In March 2019, Bill was at the Ancient Technology Centre, firing Black Burnished Ware replicas in a kiln made of turf. A report and images can be found at this link. 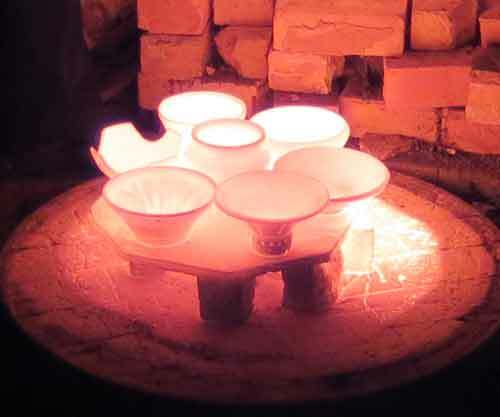 In June and November 2018 Bill conducted Pit Firings with his fellow potter Jennie Hanrahan. There archives of images and comments at this link June.and at this link November. Bill standing in the Pit, removing the contents. On 5th November 2016, Bill and friends did some experimental firings of their ancient pottery replicas at the site of the Upwey Village Bonfire. See this link for a description of the activities. There is a page that features images of Bill's studio at home, after being set up for the Artwey Art Trail in September 2014. 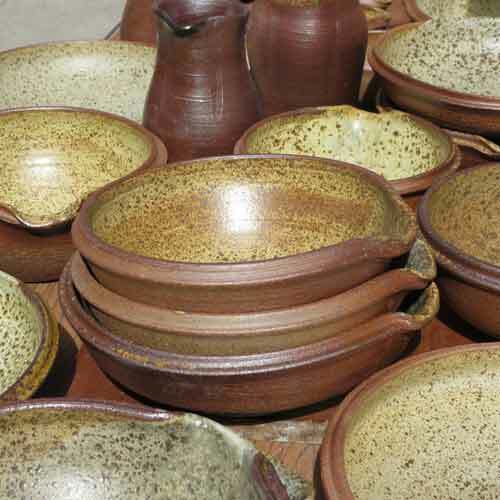 Bill has a passion for ancient pottery, he undertakes experimental archaeology and explorations into Neolithic and Bronze Age techniques. Bill's most famous commission was the collection of replicas for the Hengistbury Head Visitor Centre, see details at this link. 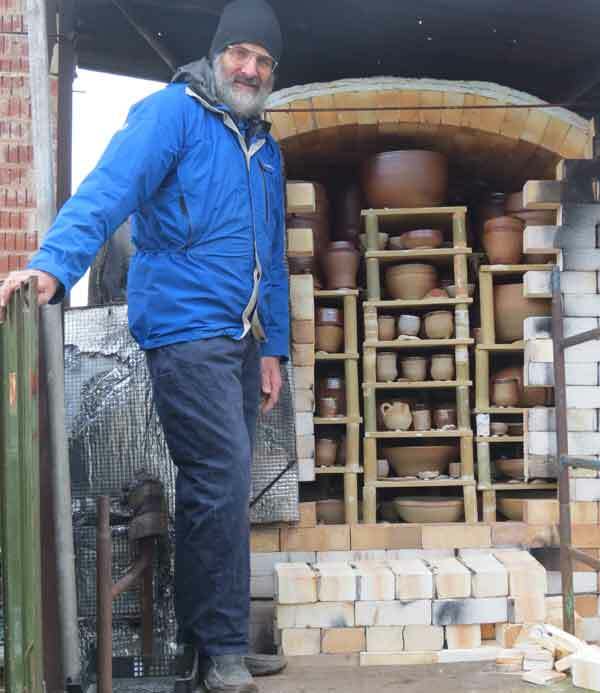 Bill undertakes experimental pottery firings, using bonfires and simple kilns made of turf. A clamp firing experiment at Martin Green's Farm by Bill, more can be seen at this link. Recent commissions include beaker replicas for Somerset County Council Museum service. They are copies of the 3 beakers found at Hincley Point in the Wick Barrow and Neolithic style bowls, there is a page about this project at this link. 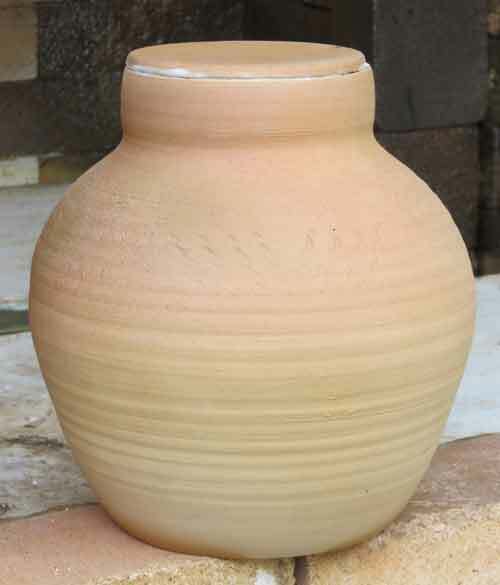 A sample cremation urn, being developed for Higher Ground Meadow, a local natural burial ground where a large bronze age style barrow is being built with niches for urns. 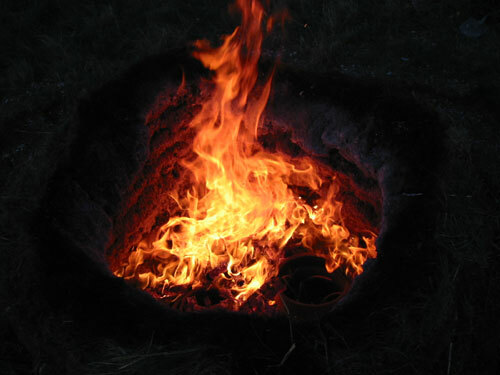 Bill also conducts Raku firing, more can be seen at this link. There is an interesting introduction to the spread of beaker culture at this link. 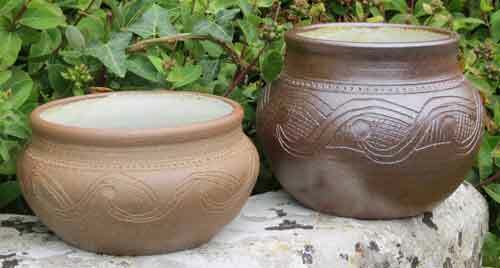 Bill is a potter living and working in Dorset on the south coast of England. These pages provide a taster for some of Bill's pottery activities, such as workshops, with links into the archive pages dealing with particular events, such as projects or firings. 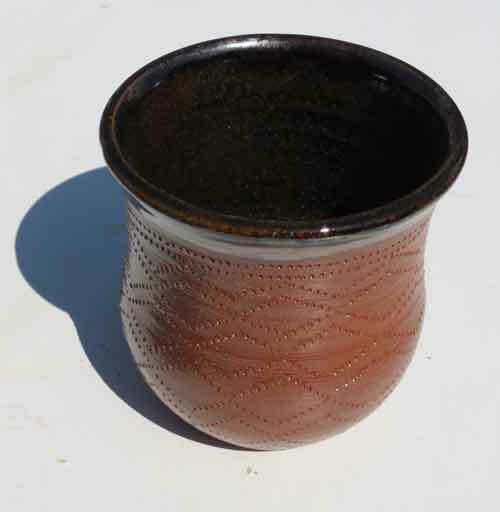 This is a wood fired beaker, with decoration applied with a comb. Details of the firing are at this link. This is a YouTube video of Bill throwing a collared urn, it has been speeded up to last a minute, instead of 15! Bill has built a large brick kiln which is fuelled with wood, follow this link to see an archive of each firing. A batch of collared urns fired in the wood kiln, decorated by rope impressions, toasted by the flames and ash. Some are hand-built, some thrown. See this link for the story of their firing. Bill also makes contemporary pottery, but most of that is heavily influenced and inspired by ancient wares. He throws these and fires them either in electric kiln or the wood kiln above. "Mortaria" Wood fired bowls in the style of Roman Mortaria. 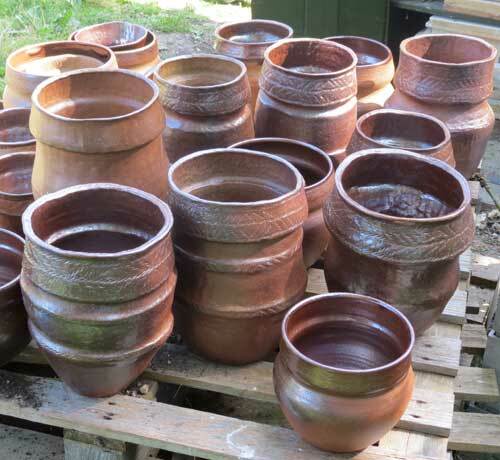 Bill made a batch of replicas of the Amesbury Archer beakers and fired them in an open bonfire, there is a page about this project, including a YouTube video at this link. Use the button below to tell your friends about this website and do other stuff like that! These webpages were set up originally to promote all aspects of the Bronze Age, but recently that content has been moved to a new site, managed by Bill for the Ancient Wessex Network at this link.